The Nintendo Labo Vehicle kit is far from a new Zelda game, but while building it recently, I had flashbacks to some of my favorite parts of some of the best Zelda adventures. I can’t stop telling people this. I hope not everyone thinks I’ve lost my mind. Like the first two Labo kits released last spring, the Vehicle Kit consists of sheets of perforated, pre-creased cardboard that Nintendo expects users to fold into contraptions that attach to a Nintendo Switch to control interactive experiences and video games. 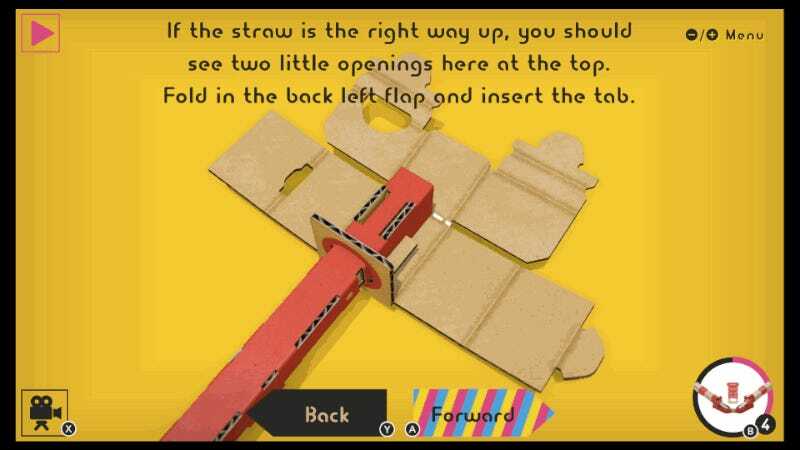 The previous ones involved combining the cardboard and the Switch to make, among other things, a piano, a fishing rod and a robot-controlling backpack. The Vehicle Kit tasks users with folding cardboard into a flight stick, a submarine controller and a steering wheel—complete with brakes, a pulley and the kind of levers and knobs you’d use to operate windshield wipers. You use all three to control a vehicle that you can use to drive, dive and fly in a small open world. You make the stuff before you can play the game, and it was during the construction phase where my mind drifted to Zelda. As I made that steering wheel, I began to feel, of all things, like I was going through a dungeon in Ocarina of Time or Skyward Sword. I know this sounds weird and maybe desperate. Here I am a Zelda aficionado in a year bereft of new Zeldas, possibly seeing an adventure of Link where there isn’t one. When you go through a dungeon in a Zelda game, you start in a state of confusion. You’ve just entered a mysterious place. You know that, as Link, you will be confronted with puzzles and traps and initially inaccessible rooms. You trust that if you start carefully and follow the cues that lead you to the first one or two rooms you can get to and puzzles you can solve that eventually you will get through the whole thing. The best Zelda dungeons seem to make no sense when you first come upon them, then gradually reveal themselves to be cleverly, coherently designed intricacies. A great Zelda dungeon gives players the sensation of ingenuity, but the eurekas come pre-bottled, waiting to be uncorked as you work your way through. They’re never actually that hard, thanks to the guiding hand of the game’s designers, who never leave players with that many problems to mentally sort through at once. That way, you feel smart solving stuff but are never in that bad a state. Arguably, they’re fun because of that. You’re not following directions, but you’re not really figuring that much out on your own, either. With a Zelda dungeon, you’re given a complex problem that is enjoyable to solve. Making the Labo steering wheel turned out to evoke some of the same sensations, even if in this instance there actually were directions. I started with 10 sheets of cardboard and no clear sense of how it was all going to come together to form a functional wheel with levers and knobs and whatnot. 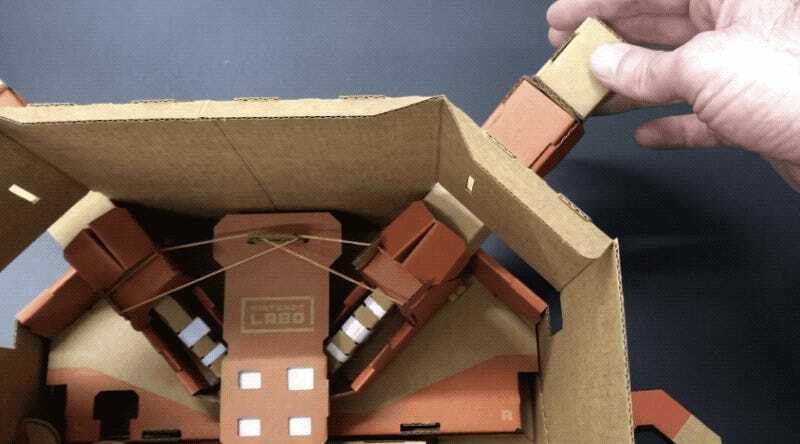 Labo kits come with digital instructions that walk you through the steps, having you punch out a few pieces of cardboard at a time and then fold them, piece them together and add them to a larger whole. They may as well be Zelda dungeon rooms being solved one at a time. Eventually, the cloud of confusion goes away, the cardboard begins to look like something functional and you wind up with a wheel. It’s quite brilliant. Take, for example, the construction of the wheel’s levers, which are hooked up to the Switch to activate various power-ups as you drive a video game car. You start by being instructed to punch out a couple of pieces of cardboard. Fold the long creases and you wind up with what look like straws. The directions had me rest the straw into another piece and suddenly I was making a knob. Notice how two tabs from the new piece lock into the straw. Then I put the whole thing through another strangely shaped piece. And then I locked it in. Notice that all of this is happening with cardboard, so far. What were a bunch of flat pieces are now a spindle, a knob, and some sort of collar that stays still and is held in by yet another piece of cardboard that serves as a lock. 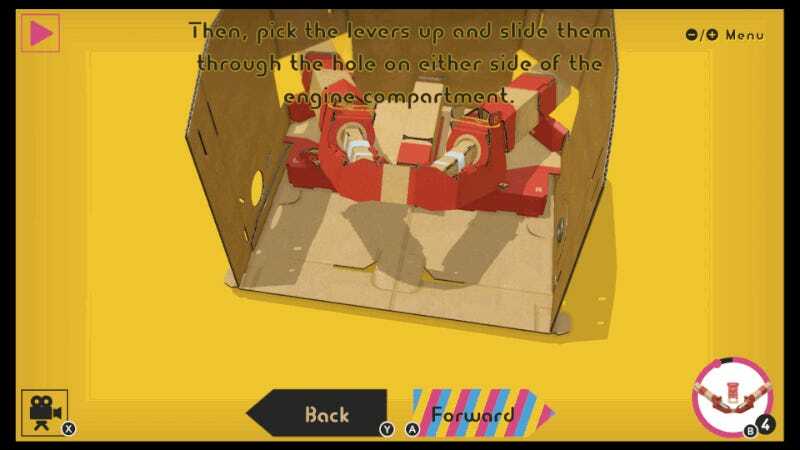 As I followed the Labo kit’s directions, I often only had half a grasp on what I was building, same as I’d only have half a sense about how each room in a Zelda dungeon might bring me to the overall chamber’s conclusion. Sometimes you have to leave part of a Zelda dungeon behind, since you don’t yet have what you need to solve a certain puzzle. You move on, find a key item and then can go back, your newfound key ready for an old lock. You use it and advance. That was happening with Labo, too. Before I’d made the spindle and its knob I’d made a horizontal piece with a pinched center that I didn’t understand. As the directions progressed, though, it began to make sense. It was the other part of the levers. I put the spindle in the horizontal piece, did the same on the other side to form two levers. I put something they called the “clacker” into the base of each. Then I slid the whole contraption into a larger base. I could never have guessed it would all fit together so well. 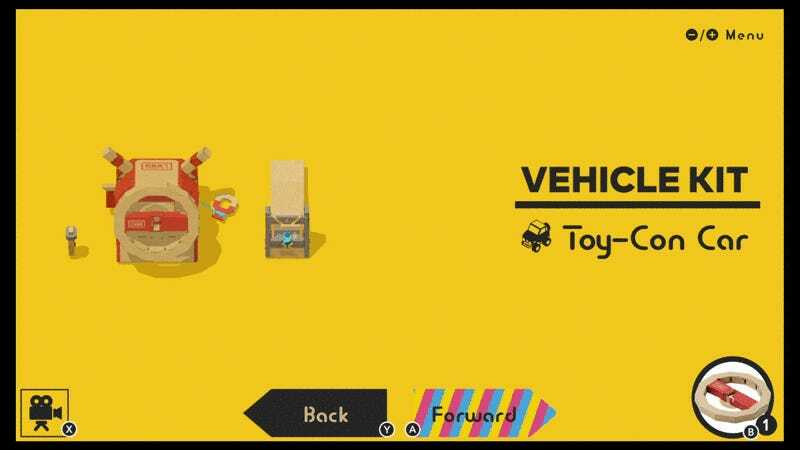 The Labo Vehicle kit isn’t all cardboard. You use rubber bands to give some moving parts some snap. You use string to make an accelerator ripcord. You use special white tape that is tracked by a sensor on a Switch controller in order to track how the moving parts of the steering wheel move and send those signals to the rest of the Switch and then to the TV to translate physical steering into the controls of the video game car. If we go back, though, to just the part I’m focusing on, it is all cardboard. What’s been made is ingenious. The first flat pieces became spindles. They got cube-shaped knobs attached to them. They got collars that locked up high near the knobs and then also locked into the base of the levers. All of this allows the knobs to still turn and to rotate the spindles, one clacking quarter-turn at a time. Thanks to some rubber bands, you can pull the levers, too. The rest of my time making the steering wheel involved other a-ha moments, as flat cardboard turned into functional contraptions. When I was making the submarine controller, for example, I was amazed at how a couple of pieces of cardboard turned into a functional button. I’m sure I could get some of this feeling from making a complex Lego, but having it happen with cardboard that turns into functional moving parts feels all the more magical. The path from confusion to clarity is pleasing. Being taken on that path by top Nintendo designers is a treat. Nintendo will eventually make another Zelda game and maybe even include more than four or five dungeons in it. I’ll be there to play it when they do. For now, though, I’m delighted to have gotten the same feelings I get from going through one of those dungeons from the most unexpected of sources. 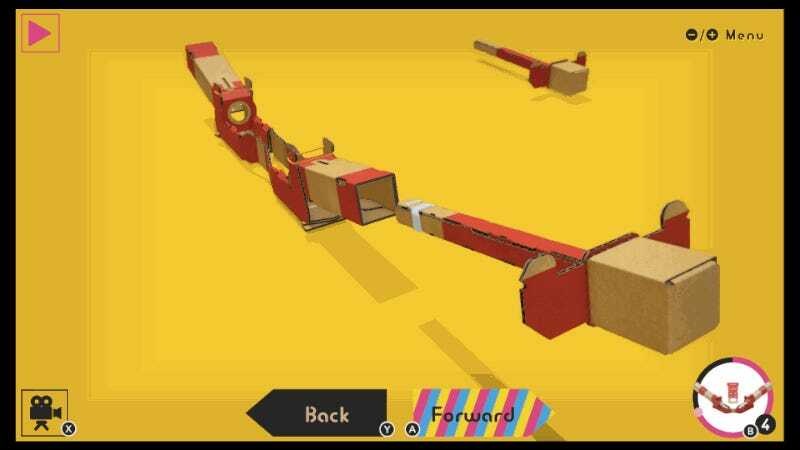 The Nintendo Labo Vehicle Kit is no Zelda substitute, but it caught me by surprise by striking some similar notes. 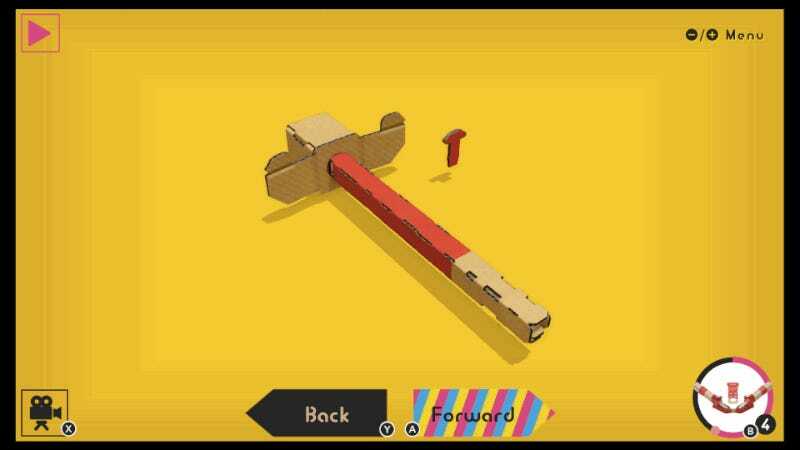 Now if only there was a Labo hookshot.